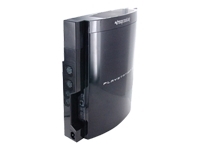 Keep your console running at optimal conditions with the Intercooler for PlayStation 3. The Intercooler's patented technology insures steady and improved airflow within the console keeping your investment running at optimal temperatures. The Intercooler clips on easily to the back of the console, no tools required. Featuring a pass through power connector the Intercooler is powered by the PS3, and requires no additional wires or batteries. A variable fan speed potentiometer allows users to choose a fan speed that works for them while the compact design allows for vertical or horizontal placement of the PS3 making it ideal for any home theater set-up.